With the absence of the entire North Carolina defense, the LSU-North Carolina game is suddenly no longer intriguing, so College FootBlog decided to break down the other key match up in Week 1 of the 2010 college football season–Boise State vs. Virginia Tech at FedEx Field in Washington D.C.
College FootBlog will analyze the strengths and weaknesses of each team, and we will give our first game prediction for the new season. 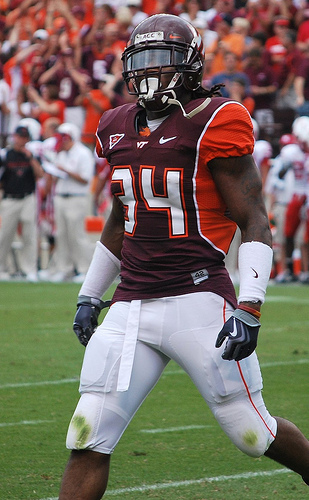 First, let’s take a look at the Hokies. Running Game: Although Alabama is getting all the hype for the best tailback tandem in the country, Ryan Williams and Darren Evans would like to throw a hat in the ring as well. Williams broke Evans freshman rushing record last season by rushing for 1,655 yards and 21 TDs. 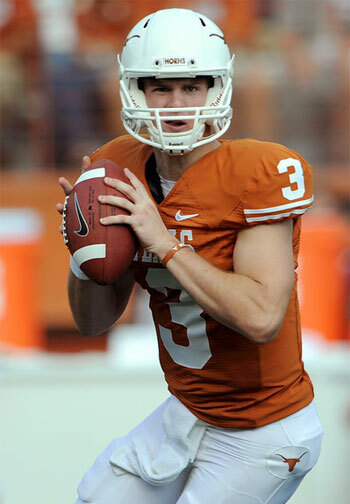 He replaced Evans, who tore his ACL and missed the 2009 season. In 2008, Evans rushed for 1,265 yards two seasons ago. He is back, he’s healthy, and he gives a huge shot in the arm for what was already one of the top rushing teams in the country. Defense: The Hokies must replace seven starters from last year’s defense, don’t bet against defensive coordinator Bud Foster’s ability to coach up a defense. Foster had all spring to reload, and although the departure of DE E Jason Worilds and inexperience up front, Foster will have his unit ready to play Monday, and they will only improve as the season continues. Despite the losses of several key players on the defense, look for Virginia Tech to have yet another top 25 defense by season’s end. 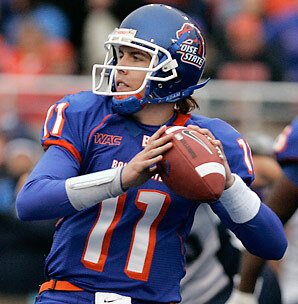 Kellen Moore: The Heisman hopeful completed an unbelievable 39 TDs last year to just 3 Ints last season. The Broncos have a very solid running game, but Moore leads one of the top aerial attacks in the nation. Moore has plenty of weapons around him, highlighted by senior wideouts Titus Young and Austin Pettis. Look for BSU to throw the ball early and often on Monday. Tough to Find One: BSU has pretty much kicked the notion that they can’t play with the big boys to the curb. Head coach Chris Peterson is 4-1 against teams from the BCS conferences. They had a balanced attack last season, and the only area of their game that wasn’t lights out was their defense against the run. They still finished 28th in the nation and were able to neutralize TCU and Oregon on the ground. When they went against Fresno State’s Ryan Matthews, however, it was a different story. Matthews went for 234 yards and three TDs against the Broncos, proving that a dominant RB can have success against them. But again, that was just one game, and this BSU defense is a year older and wiser.